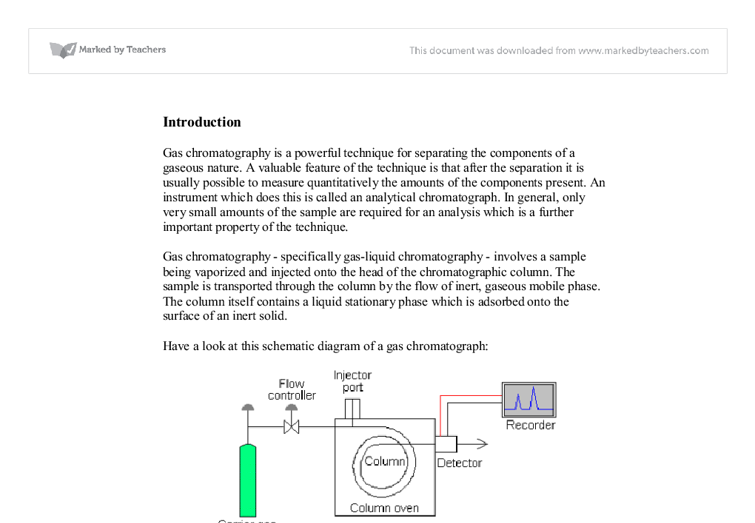 Introduction Gas chromatography is a powerful technique for separating the components of a gaseous nature. A valuable feature of the technique is that after the separation it is usually possible to measure quantitatively the amounts of the components present. An instrument which does this is called an analytical chromatograph. In general, only very small amounts of the sample are required for an analysis which is a further important property of the technique. Gas chromatography - specifically gas-liquid chromatography - involves a sample being vaporized and injected onto the head of the chromatographic column. The sample is transported through the column by the flow of inert, gaseous mobile phase. The column itself contains a liquid stationary phase which is adsorbed onto the surface of an inert solid. 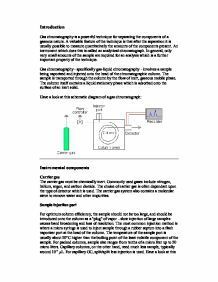 Have a look at this schematic diagram of a gas chromatograph: Instrumental components Carrier gas The carrier gas must be chemically inert. Commonly used gases include nitrogen, helium, argon, and carbon dioxide. The choice of carrier gas is often dependant upon the type of detector which is used. ...read more. GAS CHROMATOGRAPH: PYE UNICAM 204 CHROMATOGRAPH DETECTOR: Thermal Conductivity COLUMN: Ropak Q CARRIER: Helium COLUMN TEMP: 180�C DETECTOR TEMP: 250�C INJECTOR TEMP: 250�C INJECTION SIZE: 2.0�l COMPUTER INTEGRATOR: ATI UNICAM 4880 DATA HANDLING SYSYTEM b) 5.0 �l syringe SAFETY APPARATUS Lab Coats Safety Gloves Safety Glasses METHOD a) Switch on the chromatograph and the integrator for some time before actually commencing the practical. This is to allow the machine to be ready for the introduction of the sample. b) You will be provided with: 10% ethanol / 90% water (w/W) 30% ethanol / 70% water (w/W) 50% ethanol / 70% water (w/W) 70% ethanol / 70% water (w/W) 90% ethanol / 10% water (w/W) 100% water Sample A Sample B Sample C c) Introduce about 2�l of each of the liquid that is to be analysed into the 5�l syringe d) Inject the sample into the front injection part located on the front left hand side of the chromatograph. You may experience some magnetic resistance while inserting the syringe. ...read more. The anomalies could have occurred as a result of errors that could have happened during the experiment. A major source of error discovered during the experiment was the presence of bubbles in the syringe when the volumes of the samples were being measured. This affects the accuracy of the chromatograph readings. Also, the syringe might not have been properly cleaned after each sample was taken and this would affect the purity of the next sample. CONCLUSION From the values obtained during the experiment for the ethanol peak areas obtained during the experiment for samples A, B and C and from the graph drawn for the known ethanol concentrations, I found the concentration of ethanol for the samples. Sample A 20% Ethanol Sample B 34% Ethanol Sample C 62% Ethanol This experiment can be improved by using a higher range of ethanol concentrations and obtaining more readings for each of the known samples and the unknowns and finding an average for the peak areas. This would improve the accuracy of the readings and thus improve the overall experiment. Bubbles in the syringe could be minimised by taking extra care when measuring out the samples. A larger syringe could possibly be used. ...read more. May be stored in stainless steel containers. Store in an area having corrosion resistant concrete floor. n/a Phenol: Type of Hazard Acute Hazards/Symptoms Prevention of Hazard Solving Hazard Fire Combustible. No open flames. No contact with strong oxidants. Alcohol-resistant foam, powder, water spray, carbon dioxide. A chromatographically pure substance is the result of the separation. Because cleansing of substances is required to determine their properties, chromatography is an essential tool in the sciences concerned with chemical substances and their reactions. Chromatography is also used to compare and describe chemical substances. Test 1 Test for the presence of a carbonyl group to find out whether ethanal had been formed. Put 5 cm3 of 2,4-dintriophenylhydrazine in a test tube and cautiously add 5 drops of the distillate. Record your observations. Test 2 Test for the presence of an acid group to find out whether ethanoic acid had been formed. Hypothesis: I will hypothesize that "Yes," their will be the same temperature as the phase changes from solid to liquid. The potential energy stays the same and nothing else is contributed. Materials: o Crushed ice o 3 Ice cubes o Thermometer o 1 1000 ml beaker o 1 250ml graduated cylinder.